I also picked up the same plant last year as Cupulispathum. Earlier that year I had gone to the Huntington Library and photographed their specimen that is planted in the conservatory. Of course, after seeing this specimen I knew I had to have at least one for my collection and was stoked when I found a few available. Check out this image I took of the specimen A. cupulispathum at the Huntington. The blades on this plant were about 5' long. 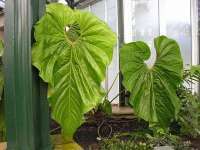 Say, I have experienced the petioles to be kind of weak and need staking to support the huge leaf. Maybe this is due to softer greenhouse growth, or an inherent problem with the juvenile growth? Have you experienced the same with yours? How much light is your plant exposed to? >I also picked up the same plant last year as Cupulispathum. >least one for my collection and was stoked when I found a few available. >Check out this image I took of the specimen A. >cupulispathum at the Huntington. The blades on this plant were about 5' long. this is one gorgeous plant and a wonderful photo. does this grow outside in normal CA weather at the Huntington? actually this gave me goosebumps of plant lust when I saw it. Yes, this plant does cause 'chicken skin'. I had another image of it next to the curator, but wasn't sure if I should use his image. To see it next to a tall man made it even more impressive. 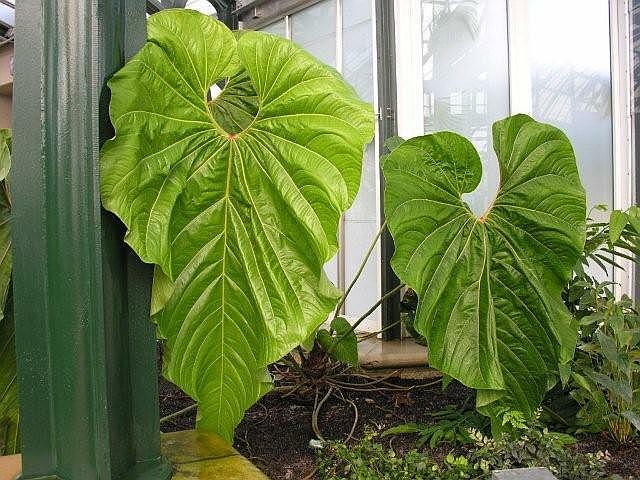 The Huntington grows it inside a climate controlled greenhouse. I'm not sure as to how well it would survive or thrive in the open without the humidity. I think this species may come from a wet area in nature, by the looks of the spath that it presented. It's flower shape was one where the spath acts as an umbrella to protect the spadix from becoming wet during a rain. I can tell you though, this plant has extremely thin leaves that rip, tear and bruise easily. I had dreams of planting one outside in the landscaping, but after growing it for a while I don't think it would look as spectacular with it's blades shredded. If you get a chance to pick one up, try it as a houseplant, if your greenhouse is too tight. If you are still located in SOCA, head over to the Huntington for the day. They have recently built a tremendous conservatory with bevy of aroids and other beautiful plants, and it turned out spectacular to say the least! several new leaves this past summer. > see it next to a tall man made it even more impressive. > greenhouse is too tight. since I live in NorCal and it gets to darn cold up here. the mature leaves are like cardboard and fairly tough ? I guess I will have to wait for another spadix to 100 % ID this one. Thank you to everyone for the information and discussion. it next to a tall man made it even more impressive. think it would look as spectacular with it's blades shredded.